dermena® repair shampoo is an innovative patented product designed for excessive hair loss of dry and damaged hair that require intensive nourishment and regeneration. Specially designed formula of the shampoo combines excellent cleansing and regenerating properties with anti-hair loss and stimulating hair growth effect. 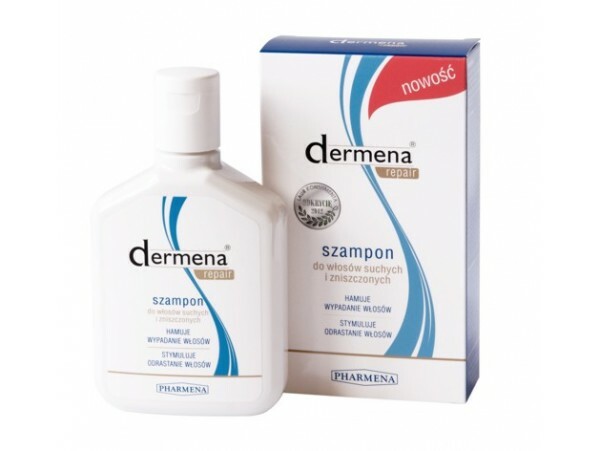 dermena® repair shampoo is an intensive treatment that strengthens, moisturizes and regenerates hair. At the same time it prevents breakage and split ends. Natural polysaccharides contained in the shampoo penetrate into the hair nourishing and rebuilding it from the inside and protect against dryness and harmful effect of the external factors. Hair regain its softness and shine. Shampoo smoothes the hair surface and makes them easy to comb and style. The best results are achieved with dermena® repair shampoo is used as a standard, everyday (or every other day) hair care. Apply the shampoo on wet hair and massage thoroughly to obtain foam. Then rinse carefully. shampoo may be used continuously. 1-methylonicotinamide chloride, a primary metabolite of nicotinamide (vitamin PP), substance protected by patent. 1-methylonicotinamide chloride is a physiological vitamin-based active substance (vitamin PP metabolite) that improves microcirculation of the scalp and strengthens the hair follicle. It improves its nutrition, extending the life cycle of the hair in anagen phase and stimulating hair regrowth. This is a substance of a clinically proven anti-irritant effect (Pol. J. Pharmacol., 2003, 55, 109). It regulates sebaceous glands and keeps the scalp healthy.